22 cm high by 14.2 cm wide. The London publishers Cassell, Petter, and Galpin have taken full advantage of the realistic possibilities of the new style of composite wood-block engraving synonymous with the New Men of the Sixties, notably such innovative illustrators as Fred Walker and such skilled engravers as the Dalziels, Thomas and Edward. The ample program of plates for this volume reflect the Sixties' veering away from Cruikshankian caricature and Phizzian comicality, and towards a much greater of degree realism, evident from the outset in the carefully realised tropical foliage in the foreground and the sharp aerial perspective that places the wreck on the horizon in the engraved title-page with a full-page wood-engraving dropped into the text. 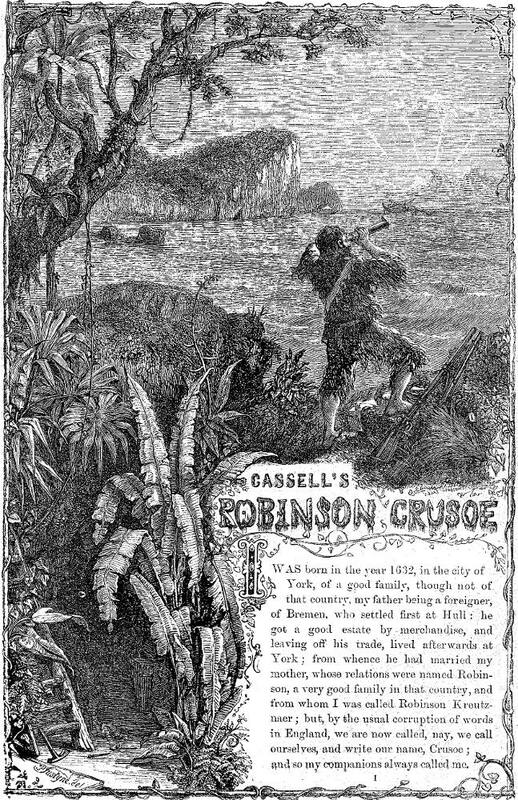 The particular moment captured by the illustration anticipates Crusoe's status not as a prodigal son or escaped slave, but rather as the castaway on a desert island some thirty pages later — although careful inspection of the illustration reveals that Crusoe is wearing goatskin clothing, and that therefore this is not the wreck of the ship upon which he arrived at the island in the south Caribbean. Defoe, Daniel. The Life and Strange Surprising Adventures of Robinson Crusoe Of York, Mariner. As Related by himself. With upwards of One Hundred Illustrations. London: Cassell, Petter, and Galpin, 1863-64.